The White-throated Robin (Irania gutturalis) is a small passerine bird that was formerly classed as a member of the thrush family Turdidae, but is now more generally considered to be an Old World flycatcher, family Muscicapidae. It, and similar small European species, are often called chats. It is a migratory insectivorous species breeding in south west Asia from Turkey to Afghanistan and wintering in east Africa. This species is a very rare vagrant to Europe. 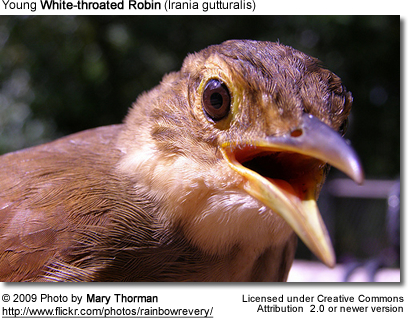 The White-throated Robin breeds in dry rocky slopes with some bushes, often at some altitude. It nests in a shrub, laying 4-5 eggs. This species is larger than the European Robin. The breeding male has lead-grey upperparts, a black face with a white throat and supercilium, and orange underparts. The tail is black, as is the strong bill. The male's song is a fast twittering given from a bush or in flight. The call of this species is a chis-it like Pied Wagtail. Females are plainer, mainly grey apart from a black tail, hints of orange on the flanks, and some white throat streaks.